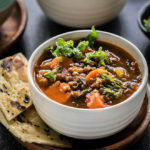 Lightly spiced and comforting Vegan Lentil Soup. 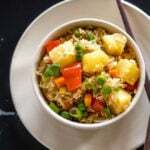 This soup makes a nutritious and filling meal. Serve it as such or along side a piece of bread. I love the soup season, Sarvesh not so much! I think he can never have soup only for dinner. He think soup is like an appetizer and he also thinks that I am crazy to have soups only for my meals! Well, I get him. If served alone, soups might not be filling for some people. The thin watery soups are definitely not filling. 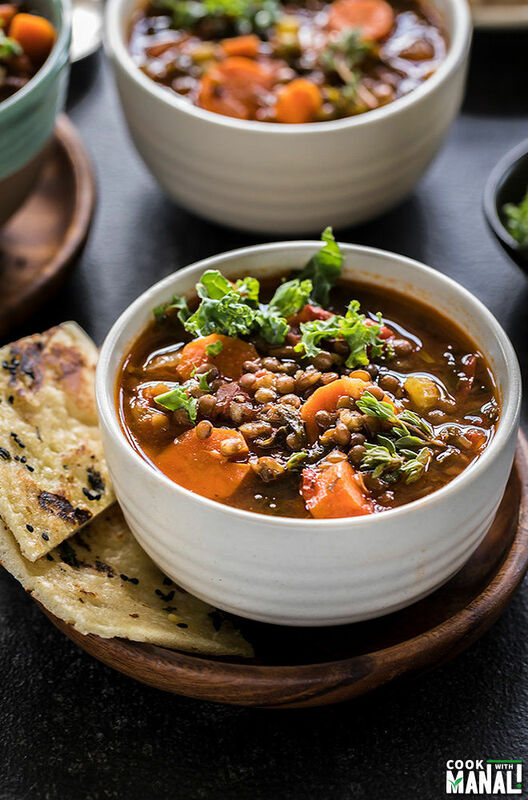 But add tons of good stuff – it becomes very filling and nutritious just like this Vegan Lentil Soup. However, this soup Sarvesh definitely ate for dinner. He didn’t even ask for a side of bread or sandwich! Lentils are as much a part of my diet as they were before, the only change is that now I also make soups and salad with them. 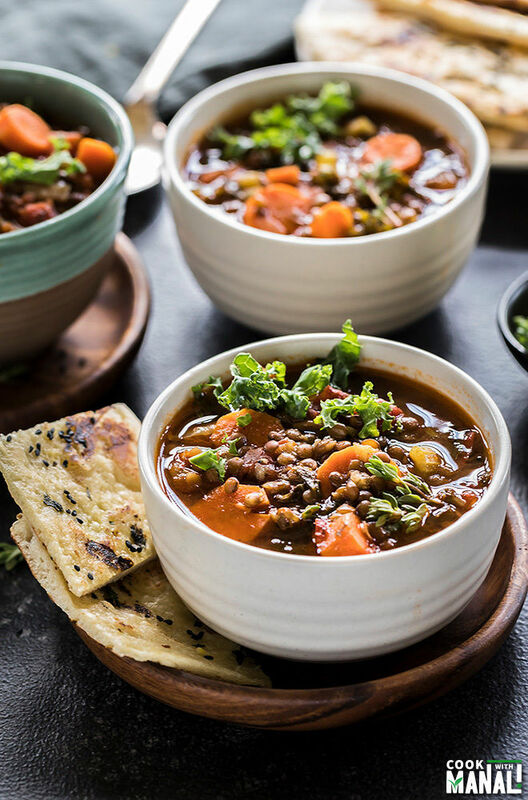 This Vegan Lentil Soup is super comforting, packed with nutritious things and just what you need on a cold day. This is a simple lentil soup, there are not many spices and not much going on here. Simple flavors and comforting for the soul. I like mine as such but you can always serve it along side a simple bread. For making a lentil soup, it’s important to pick a lentil which is good in soups. I really love the brown lentils in soups, they are flavorful and hold their shape. For this soup in particular, I was looking for a lentil which wouldn’t get too mushy too quickly. I wanted texture in this soup. 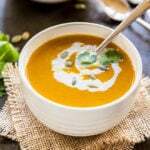 To add flavor to this soup, I have used several veggies like carrots, celery, onion, tomato. You may also add other veggies to this soup. This is all I had on hand the day I made this recipe but feel free to add veggies of choice. Potatoes, spinach, squash they will all go well! I really like using canned fire roasted tomatoes in this recipe- adds a lot of flavor. I haven’t used many spices in this soup. In fact, I have kept it very simple and let the flavor of veggies and lentil really shine through. If you like lot of spices in your soup, you may consider adding more of the spices that are mentioned in the recipe. 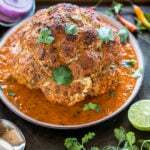 You may also add spices like curry powder to make it more flavorful. 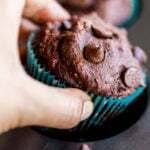 It’s all up to your taste. 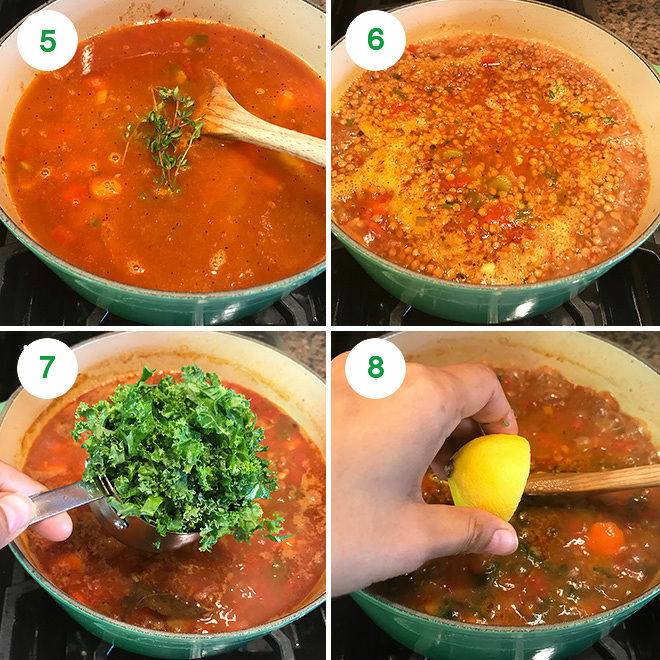 Using fresh herbs enhance the flavors and I love fresh thyme in this vegan lentil soup. You can use any herb that you like. They make the soup warmer and comforting. With the days becoming cooler, I will be making this lentil soup a lot. It’s really filling and doesn’t require much of prep work. Hope you guys enjoy it too! 1- Heat 2 tablespoons of oil in a heavy bottom pan or dutch oven. Once the oil is hot add the bay leaf. Saute for few seconds and then add the carrot, celery, green onion, white onion, ginger and garlic. 2- Cook the veggies for 4 to 5 minutes until softened. 3- Then add a can of fire roasted tomatoes and mix well. Cook for 2 minutes and then add the cumin, salt, cayenne and black pepper and cook for another minute or so. 4- Add the lentils and stir. 5- Add the broth/water and sprigs of thyme to the pot. 6- Mix well and let it all come to a boil. 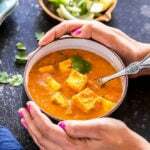 Let lower the heat to medium-low and let the soup simmer uncovered for around 25 to 30 minutes or until lentils are softened but still hold their shape. 7- Stir in chopped kale and let it cook for another 2 to 3 minutes. 8- Finally add in lemon juice, if using and mix. 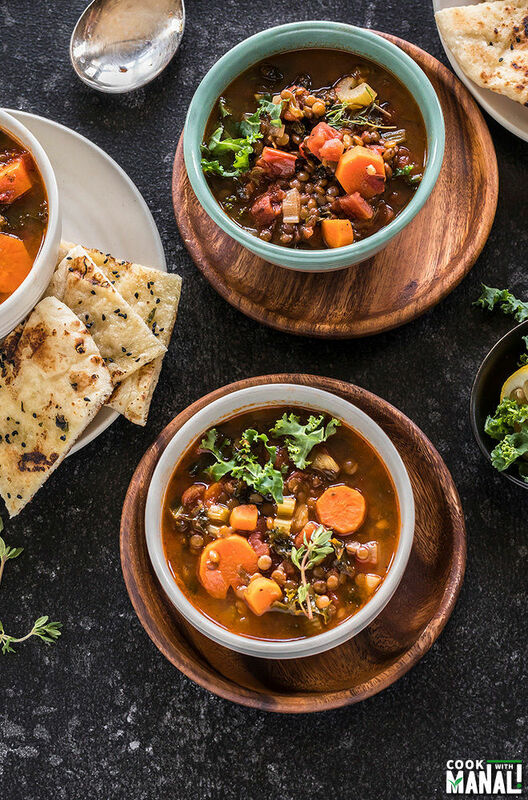 Serve this vegan lentil soup with with bread/brown rice. 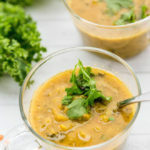 If you’ve tried this Vegan Lentil Soup Recipe then don’t forget to rate the recipe! You can also follow me on Facebook, Instagram, to see what’s latest in my kitchen! 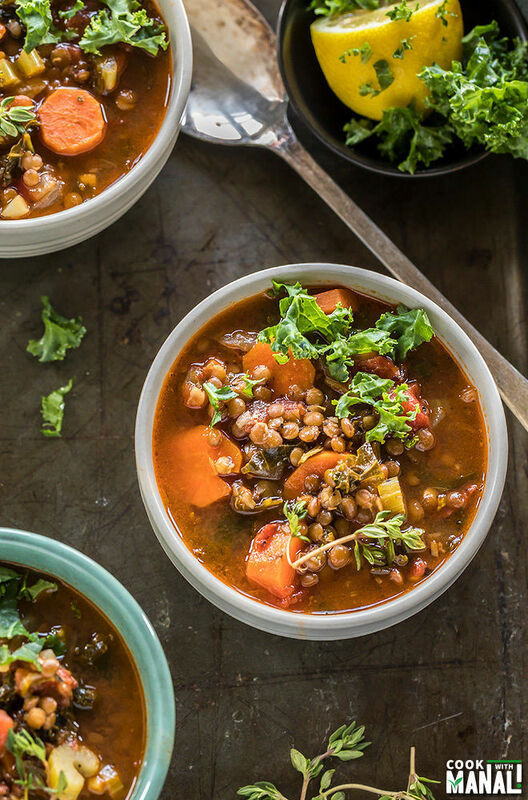 A hearty and filling lentil soup to nourish and warm your soul. Packed with veggies, this soup is mildly spiced and tastes great with a side of rustic bread. Heat 2 tablespoons of oil in a heavy bottom pan or dutch oven. Once the oil is hot add the bay leaf. Saute for few seconds and then add the carrot, celery, green onion, white onion, ginger and garlic. Cook the veggies for 4 to 5 minutes until softened. Then add a can of fire roasted tomatoes and mix well. Cook for 2 minutes and then add the cumin, salt, cayenne and black pepper and cook for another minute or so. Add the broth/water and sprigs of thyme to the pot. Mix well and let it all come to a boil. 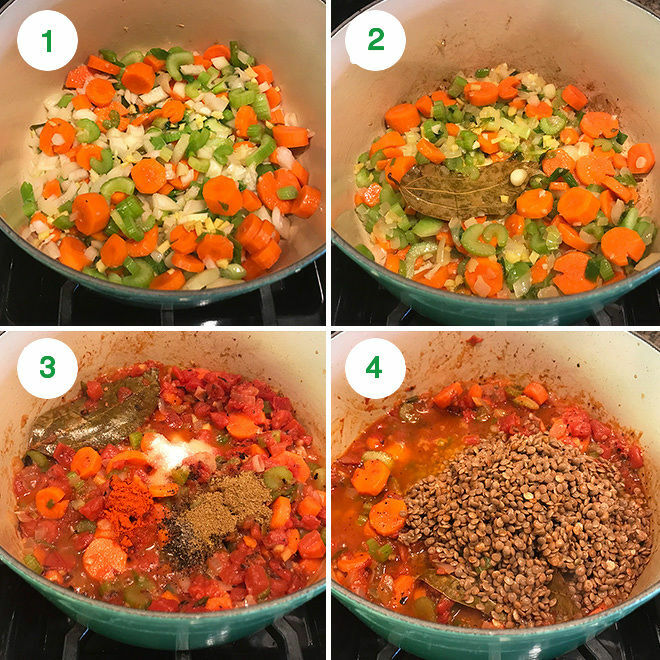 Let lower the heat to medium-low and let the soup simmer uncovered for around 25 to 30 minutes or until lentils are softened but still hold their shape. Stir in chopped kale and let it cook for another 2 to 3 minutes. Finally add in lemon juice, if using and mix. 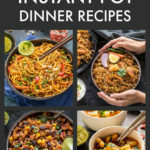 Looks like a perfectly warming and delicious meal! 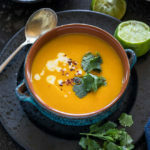 Wonderful soup for any time of year packed with protein and comfort. We made it for our family around the holidays and it was a major success! Thank you Manali!